A cold front approaches the region today and tonight and passes through during Thursday. This will bring a chance of rain this afternoon for some areas, however rain will become likely across the entire region tonight and continue into Thursday. The rain could be heavy at times during Thursday, and should end by late afternoon. Temperatures will rise through the day today, and continue to rise tonight and Thursday morning. High temperatures for Thursday will be well above normal due to southerly winds. The National Weather Service in Upton has issued a FLASH FLOOD WATCH IN EFFECT FROM THURSDAY MORNING THROUGH THURSDAY AFTERNOON. 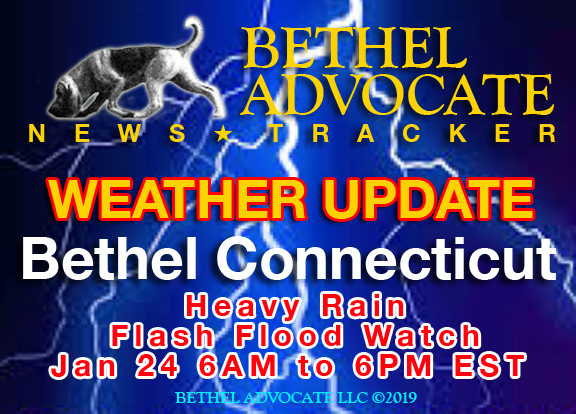 * Flash Flood Watch for portions of southern Connecticut, northeast New Jersey, and southeast New York, including the following areas, in southern Connecticut, Northern Fairfield, Northern Middlesex, Northern New Haven, Northern New London, Southern Fairfield, Southern Middlesex, Southern New Haven, and Southern New London. In northeast New Jersey, Eastern Bergen, Eastern Essex, Eastern Passaic, Eastern Union, Hudson, Western Bergen, Western Essex, Western Passaic, and Western Union. In southeast New York, Bronx, Kings (Brooklyn), New York (Manhattan), Northeastern Suffolk, Northern Nassau, Northern Queens, Northern Westchester, Northwestern Suffolk, Orange, Putnam, Richmond (Staten Island), Rockland, Southeastern Suffolk, Southern Nassau, Southern Queens, Southern Westchester, and Southwestern Suffolk. * Low pressure approaches the Tri-State Area today and passes through on Thursday. Rain tonight becomes potentially heavy at times Thursday morning with the potential of heavy downpour into early afternoon. A total of 1.25 to 2.50 inches of rainfall with locally higher amounts could occur with this event, however most of it falls during Thursday. Flash flooding of urban and poor drainage areas, as well as small streams will therefore be possible Thursday. A 30 percent chance of rain after 3pm. Mostly cloudy, with a high near 42. Wind chill values between 15 and 25. Southwest wind 9 to 11 mph. Rain, mainly after 10pm. Temperature rising to around 49 by 4am. South wind 8 to 15 mph. Chance of precipitation is 90%. New precipitation amounts between a quarter and half of an inch possible. Rain, mainly before 3pm. The rain could be heavy at times. Temperature rising to near 51 by 8am, then falling to around 41 during the remainder of the day. South wind 11 to 16 mph becoming northwest in the afternoon. Winds could gust as high as 26 mph. Chance of precipitation is 100%. New precipitation amounts between 1 and 2 inches possible. Partly cloudy, with a low around 23. Northwest wind 5 to 9 mph. Mostly sunny, with a high near 33. West wind 5 to 11 mph. A 30 percent chance of snow showers. Mostly cloudy, with a high near 36. A 30 percent chance of snow showers before midnight. Mostly cloudy, with a low around 23. A 30 percent chance of snow showers. Mostly cloudy, with a low around 24. A 50 percent chance of snow. Mostly cloudy, with a high near 39.